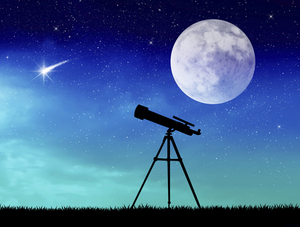 The Discovery Center at Ridgefield and New Pond Farm Observatory, 101 Marchant Rd., West Redding, are offering a public astronomy program on Saturday, December 15th, at 6:30 PM. At 6:00PM, there will be an optional mini-lesson for participants, especially children, to better understand what they will be viewing. This will take place in the classroom and is included in the price of the program. During this program, we will cross our fingers and hope to see Comet Wirtanen and some meteors from the Geminid meteor shower, which will have peaked on the 14th. Wirtanen will be the closest to the Earth on Dec. 16th at 7,260,000 miles. We will also focus on the first-quarter Moon. This occurs when the Moon is one quarter of the way through its orbit around the earth, hence its name! It is a one day event and in the days that follow it enters a waxing gibbous phase, growing into a full Moon on December 22. Participants should bring a flashlight for the walk to the observatory and dress for the weather. The program is $4 for Discovery Center members, with a maximum of $16 per family. For nonmembers, the charge is $6, with a maximum of $24 per family. Registration is required and can be done at http://www.ridgefielddiscovery.org/) or by calling 203-438-1063. If the skies appear cloudy, check the website after 4:00 PM for program status.